The Large Hadron Collider (LHC) has reached its design luminosity: . This is a significant milestone. I congratulate everyone who was involved in the design, construction and operation of the LHC. I also congratulate everyone who work on the accelerators that feed protons into the LHC. Those feeding accelerators have to perform at their peak as well. The “design luminosity” is a high bar. Designers hope that when everything – the entire accelerator complex – goes right such a luminosity could be achieved. Thousands of components have to perform perfectly without fail simultaneously to achieve this result. I was an accelerator/beam physicist. To me this is an incredible achievement. During my years as a Tevatron scientist (1988-1992) a maximum luminosity of was achieved. The current LHC luminosity is 10000 times better. After I left, the accelerator complex at Fermilab was upgraded and they achieved a maximum luminosity of in 2010. The current LHC luminosity is 25 times better than the Tevatron luminosity record of 2010. Luminosity is the number of potential collisions per second and per surface unit. 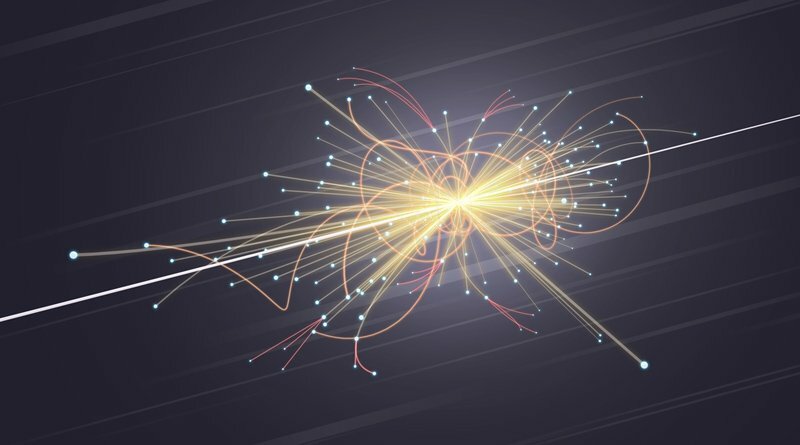 The cross-sectional area of the beam crossing point is much smaller than a square centimeter but if it were there would have been (1 followed by 34 zeros) proton-proton collisions per second. Accelerator/beam physicists love to talk about luminosity (collisions per second), the particle physicists on the other hand love to talk about cumulative luminosity. They are interested in the total number of collisions in a given year. Particle physicists use a different unit to measure the cumulative luminosity: inverse femtobarn. As of this writing, the accelerator division delivered 10 inverse femtobarn to each experiment. 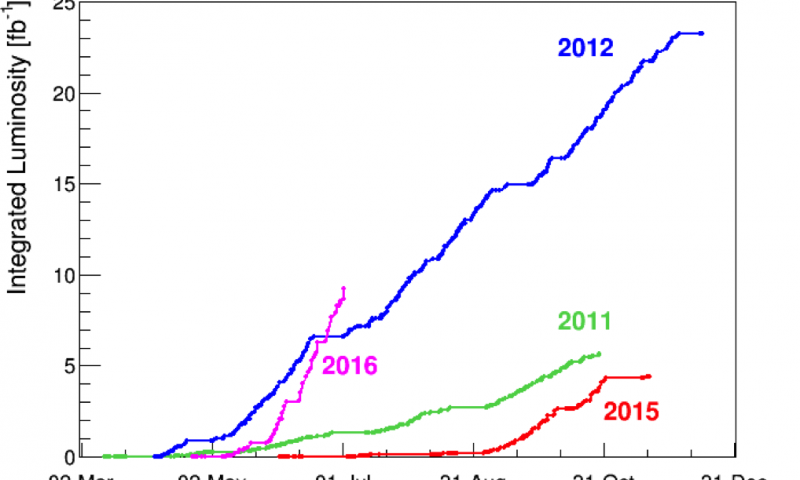 For 2016 the target was 25 inverse femtobarn but the data collection will probably exceed 40 inverse femtobarn at the end of 2016. You can watch the status of beam collisions live at the following link. This entry was posted in physics and tagged Large Hadron Collider, LHC, Luminosity. Bookmark the permalink.